Calendar Numbers – Not Just For Calendars! I was strolling through the aisles of my local teacher supply store (One of my favorite things to do! What can I say? Some people love to browse for shoes and clothes, I love to browse for educational supplies! 🙂 ) and noticed that there was a whole section devoted to calendar supplies, especially thematic calendar numbers. Obviously, I knew that they carried these materials, I just hadn’t thought to use them in a different way. I guess that’s one of the many things that Andrew has taught me – think outside of the box a bit more and don’t assume there is only one way to do something or use something! At the time I was working on numbers and number order with Andrew and didn’t really need to go any higher than 31, so I picked some up. Once I got them home and started playing around with them, I got all sorts of ideas. This is just one way I have used them as part of My Obstacle Course. 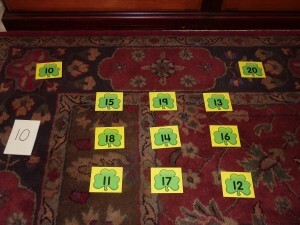 The activity is so simple and easy to set up and yet your child is working on building an essential mathematics skill. 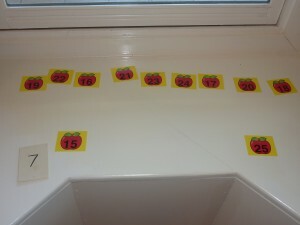 How to set up the station: Select a group of numbers that your child is familiar with but also may be challenged by them not being in order (ex. 1-10, 10-20, or 20-30. You could also set out a smaller group if 10 is too much.). Set out the first and last number and place the other numbers below, all mixed up (see photo below for example). Note: This can be done putting numbers in order from least to greatest and also greatest to least. Look at the numbers set out. Look at the first number, find the number from below that comes next. Continue until all of the numbers have been placed in the correct order. Read the numbers in order when completed. Working to put the numbers in order. These make it so easy to reinforce and build on the math skills your child is ready for and also allows you to see firsthand if they are understanding math concepts. You are able to see in a matter of minutes what they have mastered and where they are struggling. This information can then be used to create future stations that build on skills where and how they need. 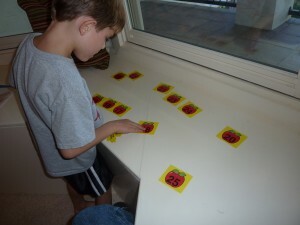 I have also found this sort of activity really helpful when meeting with evaluators and teachers because I could share with them specific examples of what he was doing in an environment where he wasn’t anxious and didn’t have to use intelligible words to show what he knew by doing this activity. Stay tuned for future posts on more ways to use these thematic calendar numbers.